I always carry my essentials in a small wallet. I hate lugging the whole big heavy kit and kaboodle freakin' pocketbook with me everytime i go out. also a similar size matching note pad. stuffed, puffy zippered jewelry cases. on their way this month. Another great find this season just in time for April Showers, is our Light up Umbrella. Battery operated, the stem lights up to gently illuminate your way at night. 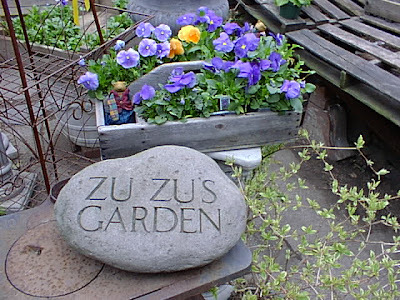 All the zuzus are anxious to get out there and get dirty in the garden. Last week, I scored 96 pots of Pansies. and offer our gratitude to whomever made The Pansy. which make up the Pansy Resume. The Pansy is billed as an Annual but is unfazed by a sudden Spring frost and can be planted out way before the more tender Annuals. I have had my pots frozen solid during a Spring Snowstorm only to thaw and re-bloom within days. The indomitable Pansy will bloom freely until the dog days of Summer heat exhaust them.I have cut them back, fed them, and watched them rally to join the Autumn rush of color. 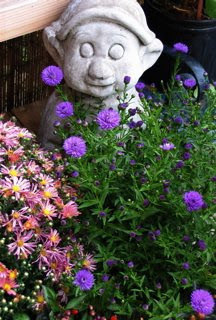 A crop of fresh plants seeded in late Summer and put out in the Fall will Winter through and pop up as early as March. From pure white to nearly pure black with all the yellows, oranges,winey reds and blues between. Both plain and fancy faced, the pretty Pansy can stand as the focal point of a Spring planting, and step gracefully to the background as it begins its summer fade surrendering center stage to its more heat hardy cousins. Yes, on top of all the rest, Pansies are sweet smelling.One of my favorite buying trips to the Nurseries comes in early March when the aroma of a truckload of Pansies keeps me company all the way home.